Use this printable declutter checklist pdf to help you finally clean out your home and remove the clutter without overwhelm. When you think about it, there are different levels of clutter. What I consider clutter and messy in my home might not be nearly the same as what you consider clutter and messy in your home. The good news is that no matter what any of us consider to be clutter we all can clean our things up with the same list of steps. As I help each person do that very thing I am amazed how I am always coming back to the same core steps. The same declutter your home checklist in a way that helps people that are stuck get unstuck. And the very best part of this clutter PDF is I have used it myself, so I am totally confident that it does actually work. I used it to clean out my hoard of an attic and I used it to clean up our slightly messy guest bedroom to get it ready for my folks to visit. I still use it to help me get my family room back into shape after the holidays because it really works that well. You see, I am a list girl. I can do just about anything if I have a list in hand telling me what to do first all the way to what do last. I can just flutter right through my list without stopping to think because all of us clutter bugs know that thinking when decluttering is a very bad thing. When you allow your head to come into play as you are decluttering your home you tend to slow down the process quite a bit. Thinking causes second thoughts and that in turn causes overwhelm which is the number one roadblock when it comes to decluttering. I knew if I had a list that would help me to keep my head out of the process because my decluttering decisions were being made for me and not so much by me. And once that whole aspect is taken out of the picture, then decluttering becomes easier, simple actually, and you can float through the entire process without much anxiety at all. How to use your Printable Declutter Checklist pdf. First – Download and print out your FREE declutter your home checklist HERE. From here on in, whenever you are cleaning out a room, make sure this list is with you. Second – Choose where you want to begin. This list covers the entire home but where you start is entirely up to you. I suggest picking a spot that is not a disaster zone so you can build on your momentum as the rooms get a bit more difficult. Because we all know how much momentum plays into decluttering. Third – Dress the part. This might seem like a silly step but actually, it can be the key to seeing this decluttering process through to the end. Grab yourself comfortable sneakers and put on clothes that are easy to move around in. The point is to have no distractions what so ever, so be ready to dive in and stay in the game from the start. Fourth – Set the tone. I love to listen to books on my phone when I am doing anything I don’t want to do. For some reason, a good book will keep me moving more than music will. And when the book is really REALLY good I have actually found myself looking for more things to do, just so I can keep on listening. I am a member to Audible, which you can read more about HERE. But you can also get audio books for free from your local library. If books aren’t your thing, then music must be. Turn on a station you love and make sure you can hear it. The point is to shut off the noise inside of your head that is going to question you as you go along this journey. Clutter can cause us to think twice, even with the silliest of items, so by having a little white noise, you will drown out that conversation that will come up in your head especially when you are first starting out. You: Why is this pair of jeans on my kitchen counter? Oh yes, I wanted to fix the zipper. Ya, that is just not going to happen so let’s put those in the trash right now. Your head: Wait. Hold up! That is money you are tossing away right there! You: Yes, but I need to get this clutter gone and to be honest I don’t even know HOW to fix a zipper! Your head: Are you crazy?! Those haven’t been there that long and you might just have some time next week. Besides how hard can it be to replace a zipper? You: Hmmm, good point. Maybe I should keep them around. I might be able to fix them next week. And just like that those jeans that have been on your counter for just shy of 4 months are back where you found them. Trust me on this, put on some headphones and save yourself from all those conversations. Fifth – Grab your supplies. This part is all up to you. Whatever is easier to work with. Trash bags, boxes, bins. Pick your potion and make sure you have plenty of it. Distractions are something else we want to avoid so if you have plenty of supplies ready to go you can keep your focus all where it needs to be. On the clutter and getting it out of your home and your life once and for all. Sixth – And this is where the magic happens, just follow the declutter your home checklist. Once you muffle the noise in your head the rest is easy. Follow the list step by step as you go about the room. Grab your declutter house checklist pdf that you printed out above and pick a room. Read the steps and check them off one at a time. Yes, you actually want to check them off. Ninja Tip: If you don’t’ want to print a new sheet out, again and again, slip your clutter checklist into a plastic page protector. Now you can check each step off with a magic marker and when you are done, wipe it clean so you can use it again! There is something magical when you check things off and you want to harness any magic that you can at this point to use for good, so grab a pen and check those babies off. When in doubt shout this out! 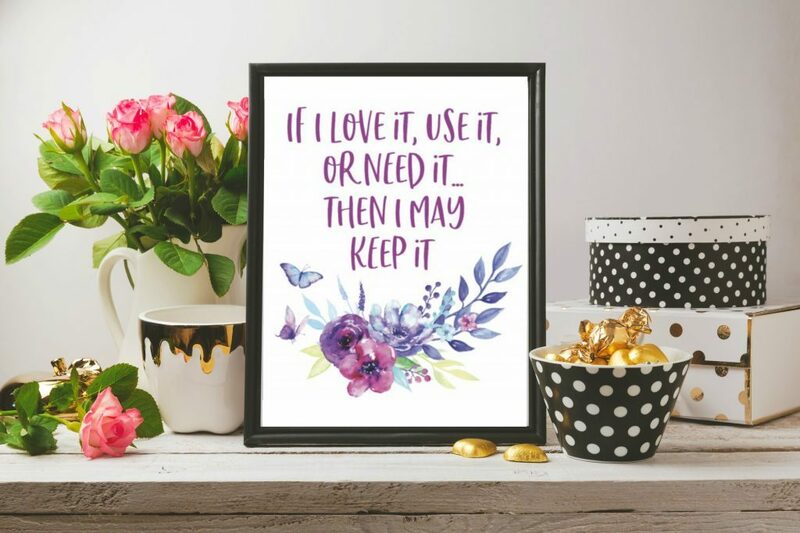 If I love it, use it, or need it….then I may keep it! If you love it – A sentimental item you simply cannot live without. Solution – Find a place to display it with respect so you can enjoy it again and again. If you use it – A tool that you definitely use even if it is only sporadically. Solution – Give it a home and keep it there. If you need it – Something you must have around because it is something you need. Solution – Again, give it a home and keep it there. More often than not, clutter is just our things in need a home. So by giving your things a home you, in turn, remove the clutter. It is amazing how this simple declutter your home checklist has changed so many lives and homes already. Sometimes it’s the simplest things that make the biggest impact. For me, it was this very same list and if you follow the steps above, this list might just be the game changer you have been looking for. But, sometimes….just sometimes, you feel you need even a bit more help to deal with this whole clutter thing. What then? I have a membership group of clutter bugs just like you and we talk every single day. We are decluttering our entire homes by tackling one area each month. The support, friendship, help, and life-changing tips are all right there waiting for you! Find out more by clicking this link HERE and see if Declutter in Minutes is the right fit for you. Don’t forget to grab your FREE declutter your home checklist below! Use it to remove the clutter in every room of your home starting today!